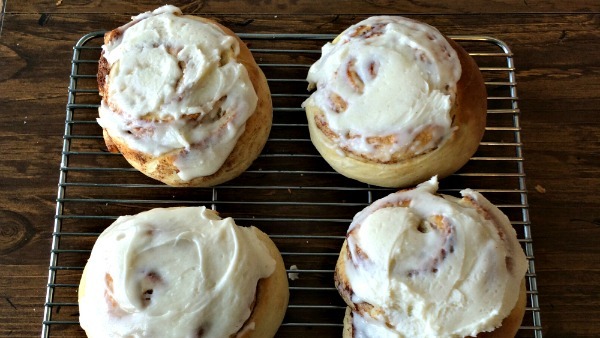 These are the best cinnamon rolls in the entire world. Making cinnamon rolls from scratch is a little time-consuming. But we love the idea of watching something so fantastic emerge from simple ingredients. We make these for Easter morning, so we thought we would share them with you today! The batch I make will give you about 40 regular sized cinnamon rolls. If you do jumbo cinnamon rolls you will get about 20. You can definitely halve this recipe if you aren’t feeding the masses. This recipe starts with the biggest mixing bowl you have on hand. If you are doing a half batch, you can use a smaller bowl, or a KitchenAid for all you people that use electricity. After you scald your milk, immediately remove 1/2 cup of milk and place it in the refrigerator to begin cooling. 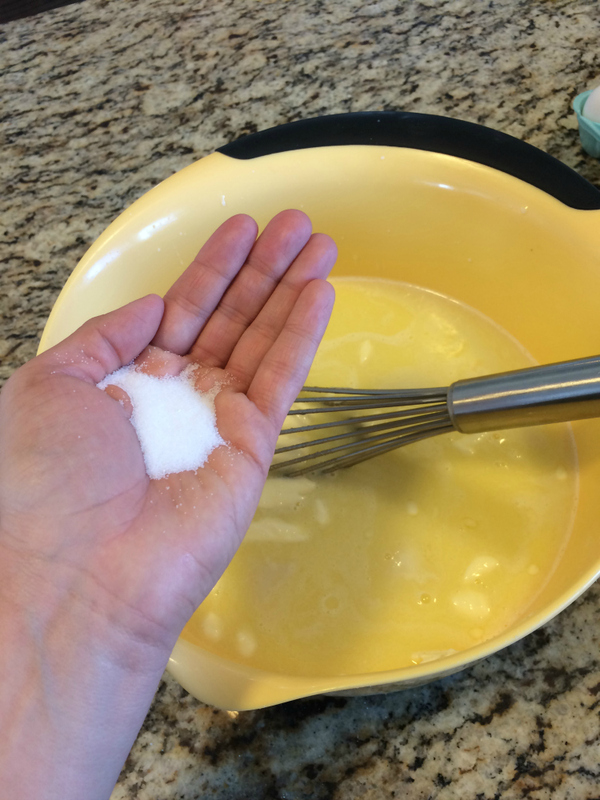 You will use this 1/2 cup to dissolve your 3 tablespoons of yeast a little later. Mix the scalded milk with the butter, and mashed potatoes. (You want pretty “plain” mashed potatoes for this — seasoned with butter and salt is fine, but stay away from pepper and herbs or other savory flavors!) You will want to whisk this or mix it with your electric mixer, for all you non-Amish folks, so that the potatoes are smooth in the liquid instead of big and chunky. Small bits of mashed potato are fine. Add your sugar and salt, mix well. I know you are now looking at a giant bowl of liquid, don’t panic, it’s going to be magical! At this point remove your half cup of milk from the refrigerator. Make sure that it is cool enough for your yeast. Liquid that is too hot will kill your yeast. The liquid should be lukewarm or a little bit warmer. Think about 110°. 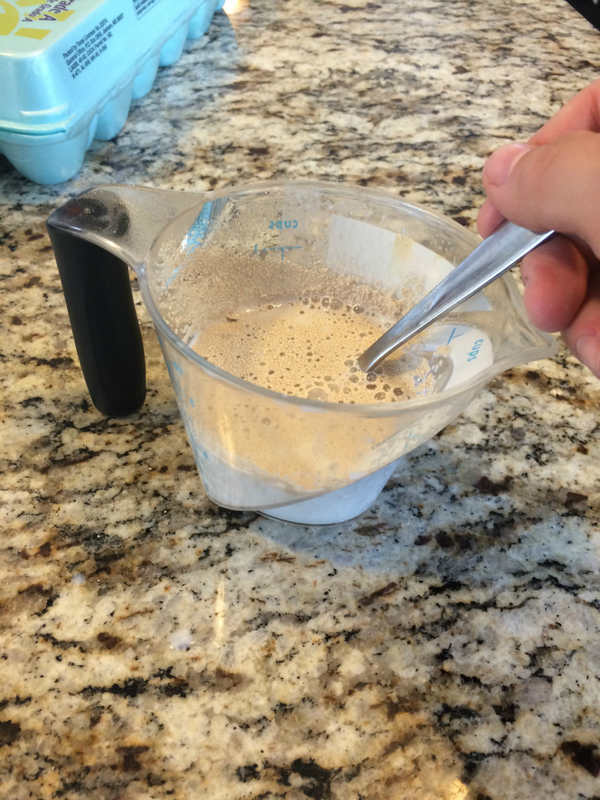 Put the yeast in the milk and give it a quick stir. Then set it aside. Return to your giant bowl of liquid, make sure that it has cooled enough for you to add to your eight eggs. Lukewarm is great. Add the eggs and beat well. Alternate mixing in some flour and then some yeast. I repeat the pattern of milk and yeast three times. I start with flour and I end with flour. After each addition you will want to mix your dough. By the end of adding all my flour and yeast I am using my hand to scoop around the dough in the bowl and come up underneath it, turning it over onto itself. Do this until you have a nicely incorporated dough. Warning: it will be very sticky. At this point, cover your dough with a dry clean towel and let it rise for an hour. If you don’t want to do this whole process on Easter morning, you can cover the dough and put it in the refrigerator after it has risen. The dough will stay completely functional for about 24 hours. 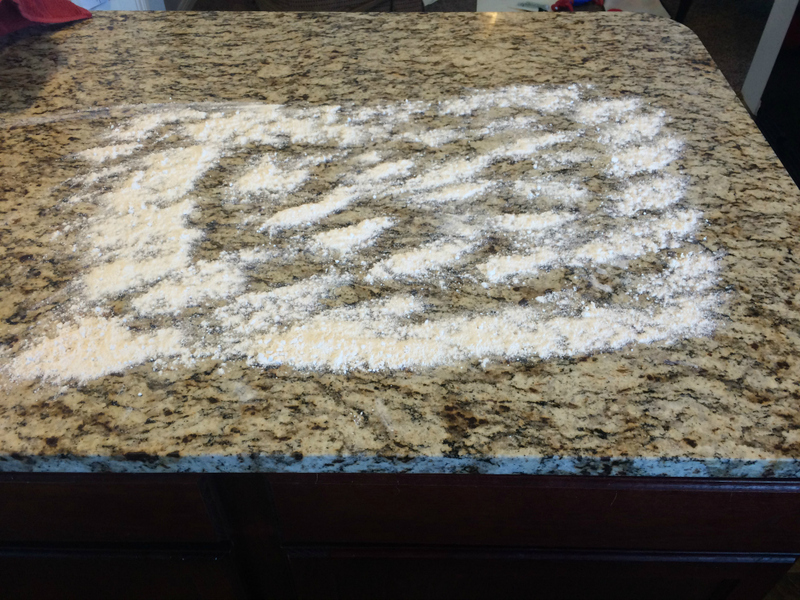 You will want to prepare to roll out your dough by putting plenty of flour down on your surface. Remember how sticky that dough was? Don’t skimp on the flour. You will need very soft or melted butter, white sugar, and cinnamon. After the hour, turn your dough onto your floured surface and gently punch it down. Roll it into the best rectangle you can make. 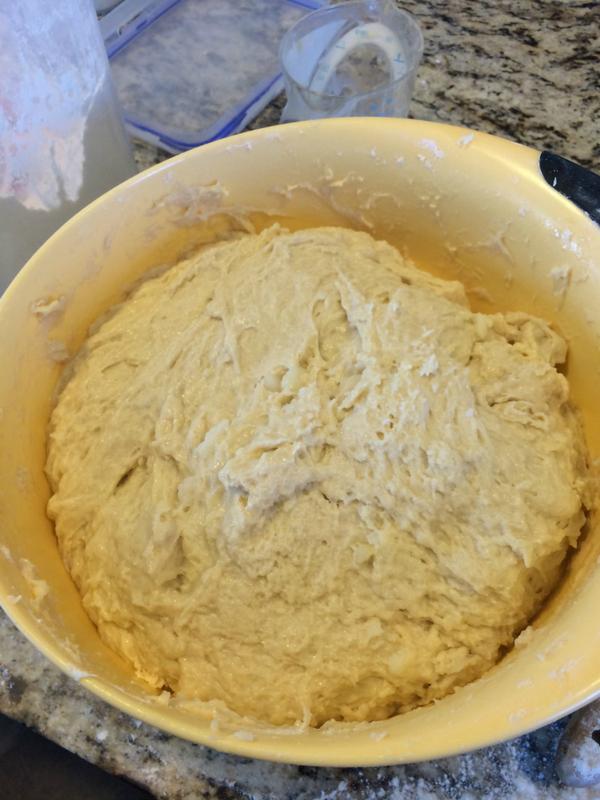 The dough should be about a third to a half inch thick. Now spread a generous amount of butter over the entire surface of your rectangle. Don’t forget the edges and corners. Follow the butter with a generous sprinkling of white sugar and cinnamon. When you think you’ve sprinkled enough cinnamon, go ahead and double it. You want CINNAMON in your cinnamon rolls. Now start from a short end and begin to roll. If your dough sticks to the surface use a flat spatula to scrape it up. Roll as evenly as possible. 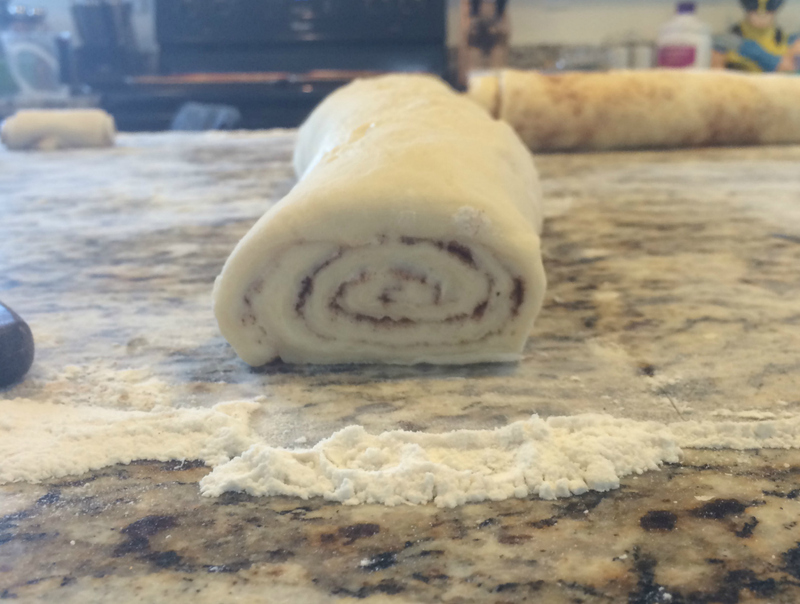 When your roll is the desired thickness, cut it away from the rest of the dough. You will roll the rest into another batch. You can do the entire rectangle if you want. Your cinnamon rolls will be bigger, and will just need to cook longer. Now cut off the ends, if they are uneven. Set them aside. I usually have 4 to 7 pieces that I call the “misfits.” I bake them altogether and frost them as best I can. You are not going to want to waste one bit of this dough. Now slice down the length of your rolled dough, cutting each cinnamon roll to a thickness of an inch to an inch and a half. If you want to make jumbo cinnamon rolls, cut them 2 to 2 1/2 inches thick. Place eight regular sized cinnamon rolls onto greased cookie sheet, or six jumbo cinnamon rolls onto greased cookie sheet. You will bake them at 375 for 10 to 12 minutes, or if you are going big, for 13 to 15 minutes. You want these to be a nice golden brown when they come out, but they will be incredibly soft. Pillows from heaven! While your cinnamon rolls bake, mix all your frosting ingredients together. You are probably noticing the butter theme throughout this recipe. Don’t cringe, just go with it, you won’t give it a second thought once you bite into one of these beauties. 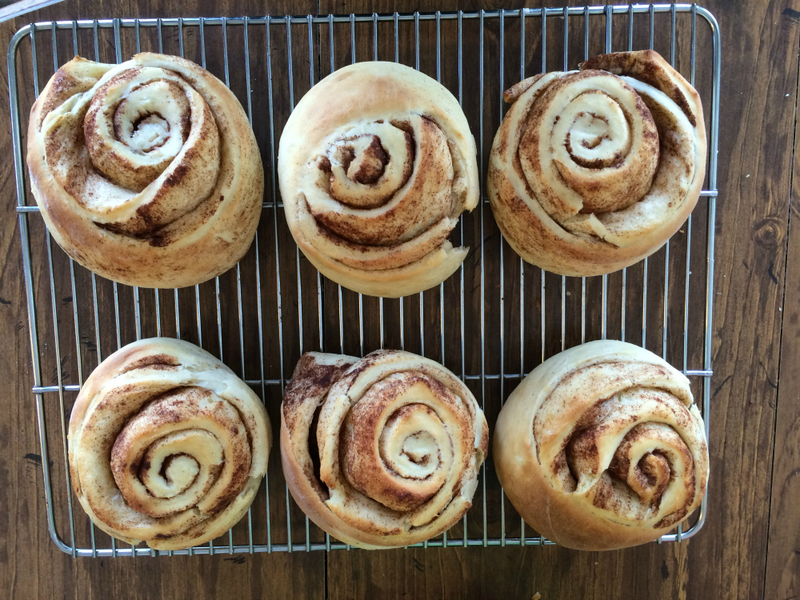 Let your rolls cool a minute or two before frosting them. Just enough so that the frosting melts slightly down the edges. Heaven. 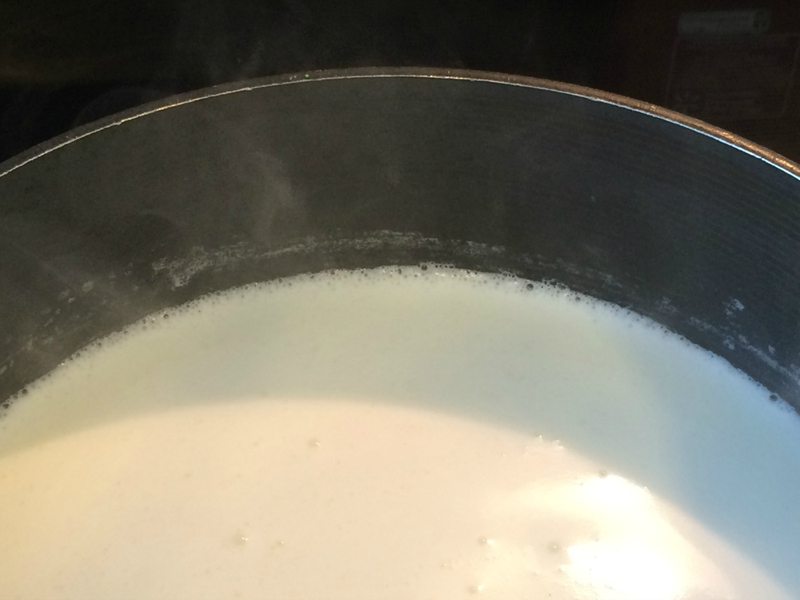 Scald milk on the stove, immediately set aside 1/2 cup to cool in the refrigerator. Add the scalded milk to a large bowl with the butter and mashed potatoes (real or made from potato flakes, either is great). Mix well. You don't want big mashed potato lumps. Remove the 1/2 cup scalded milk from refrigerator. Be sure that it's cooled to a lukewarm (approx. 110 degrees), add the yeast and stir briefly. Set aside and let it sit. Return to the milk bowl and beat in eggs. Be sure that the liquid is no longer hot, lukewarm is alright, you don't want to cook your eggs. Alternate adding flour and yeast mixture, mixing in between each addition. Begin and end with the flour. Cover with a clean dry towel and let rise for 1 hour. Spread softened butter over the entire surface of the dough. 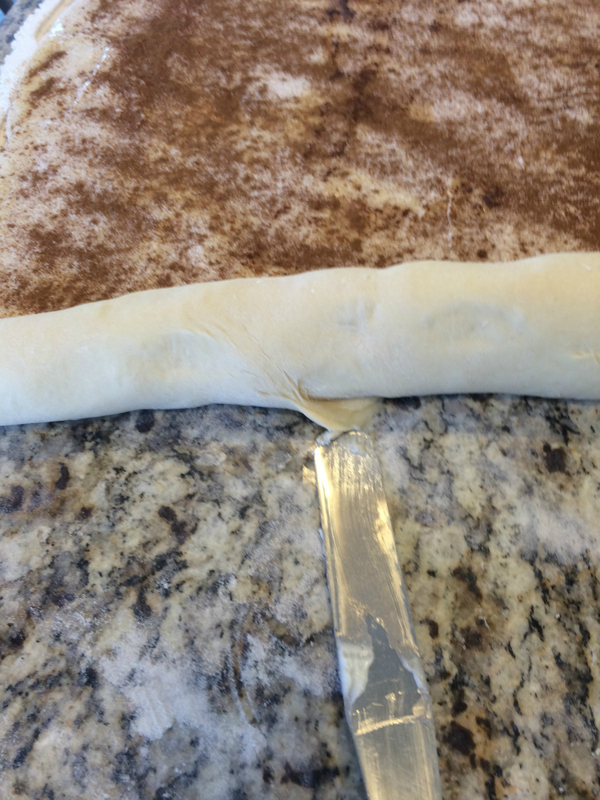 Sprinkle sugar and cinnamon generously over the entire surface of the dough. 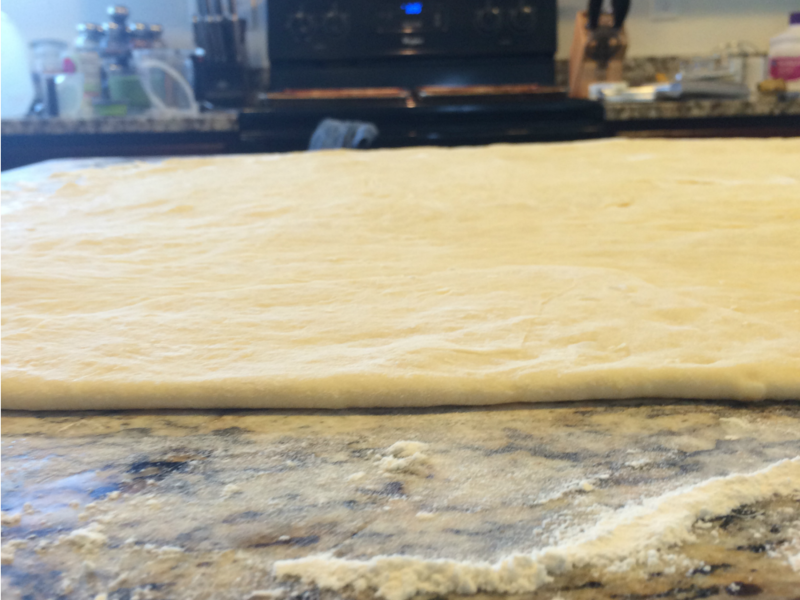 Begin rolling the dough from one of the shorter sides of the rectangle. Roll until you reach the seared thickness of roll and cut off the remaining dough to be rolled separately. Slice off the uneven ends and set aside. Slice your rolled dough into 1" cinnamon rolls. Bake on a greased cookie sheet at 375 for 10-12 minutes. Jumbo rolls should be cooked 14-15 minutes. While the rolls cook, make your frosting. Mix all frosting ingredients together and beat until the powdered sugar is well incorporated. Your frosting will have a beautiful smooth texture. 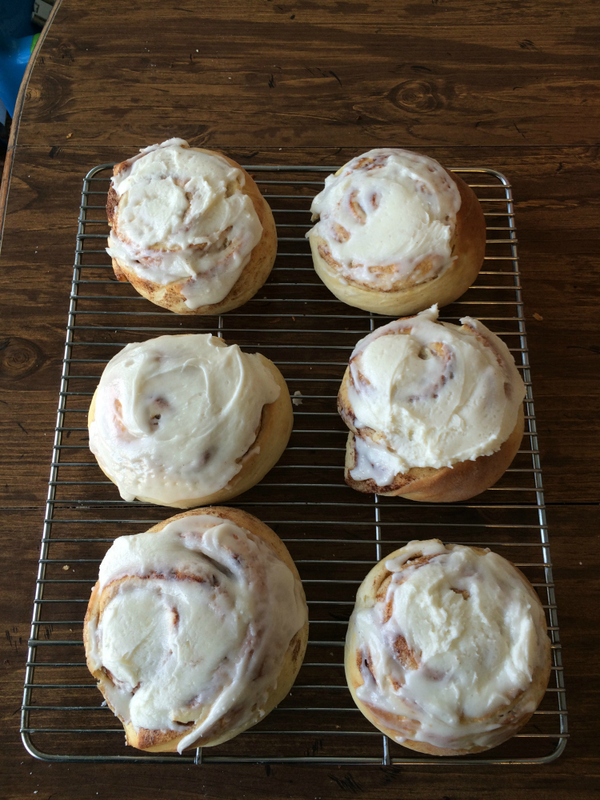 Spread frosting over slightly cooled rolls, but still warm enough for the frosting to melt slightly over the rolls. Thank you for sharing the recipe… those rolls sound appeditlich! If you need another impartial viewer to offer objective insight into your new honeybee series, please consider my offer. I find your writing style to be delightfully candid, full of characters who create their own lovable personalities. Happy Easter to your lovely family… He is risen indeed! Thanks, Cori. Will do! I can attest that they are delicious! Hi Jennifer, is your next book going to be an Amish cookbook???? Just kidding. This recipe sounds amazing! I was just going to try making your delicious cinnamon rolls. However, the recipe begins “4 1/2 Cups” of what? The recipe doesn’t say. And are there really 13-14 cups of flour??? How many rolls does this recipe make? Ach, du lieva, Susan! I don’t know how that got past all of us! It is 4 1/2 cups milk, and yes, the recipe is correct. You need about that much flour for a whole batch. Let me know how they turn out! Thank you!!! I will definitely let you know how they turn out. They look so yummy! 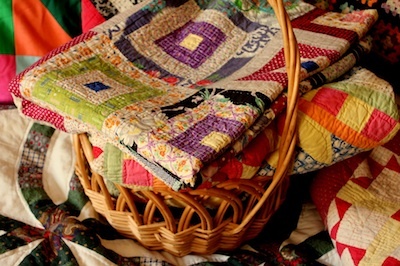 And, it makes about 20 nice big rolls or 40 smaller ones–depending on the size you roll them out to be.